Samsung, a respecatable phone manufacturer, never takes chances with their reputation as we will find out in this review of the feature-rich Samsung Galaxy Luna S120VL. 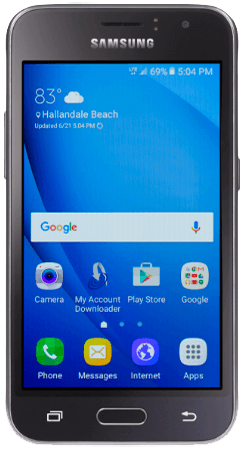 The Samsung Galaxy Luna S120VL is a 4.5-inch budget smartphone that comes running Android 6.0.1 Marshmallow. It has a quad-core processor that can handle most of your daily tasks. Let’s discover more about the Samsung Galaxy Luna S120VL in this review as we go along. 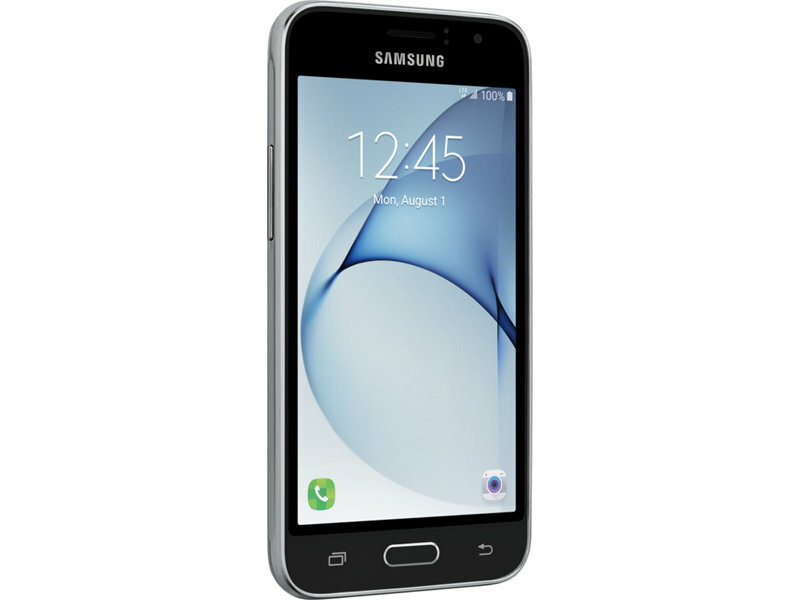 The Samsung Galaxy Luna S120VL is a prepaid smartphone available from either Straight Talk, Total Wireless or Tracfone Wireless websites. Depending on the wireless provider you choose to purchase from, the phone comes in a nice box which has devices features and the plan instruction written on top. Cutting open the box you will meet the Samsung Galaxy Luna, battery, wall adapter, a standard USB cable, activation card, services guide and a quick start guide. When it comes to exterior designs, Samsung always tries to outdo other players in the smartphone industry, even while manufacturing an entry level gadget. The design on the Samsung Galaxy Luna S120VL is quite premium. You will notice a silver finish snaking around the phone's frame giving the gadget an exquisite look. The layout of the buttons is pretty typical of most Samsung phones. We have the power button on the right edge while the volume rockers sit on the left edge. On the top edge is your headphone jack as well as the noise cancellation mic. On the bottom edge is the micro USB charging port as well as your microphone. On the front panel sits the 4.5-inch display. Above the display we have your earpiece, proximity sensor, and the front camera. Below the screen, we have the physical navigation keys. The arrangement is such that; the recent apps key is on the left, the home button at the center and the back button on the right. The back has a plain matte finish. It hosts the speaker, back camera together with its LED flash. You can remove the back cover using the slot on the top left of your device. This will give you access to the battery compartment as well as the microSD card slot. The SIM slot is under the battery compartment. That pretty much sums up our external tour of the device. Samsung phones are known to feature stunning cameras. The Samsung Galaxy Luna S120VL is not an exception. It features a 5 mega-pixel back camera and a 2 mega-pixel front camera. This being a lower end gadget, they had to minimize on the camera's pixel resolution to fit the phone within this price point, but the quality of pictures and videos is arguably good. That's one thing I like about the Samsung Galaxy Luna S120VL. If you are into videos, you will appreciate this Android smartphone. It records quality footage with a resolution of 1280 X 720 pixels at 30 frames per second. This just means the lenses are super-fast at recording and capturing every detail in the video or photo taken. The 2MP front camera comes in handy during video calling and selfie shots. Considering the price tag, the standard quality of videos and pictures captured is worth my appreciation. The back camera has a LED flash hence supports taking photos or videos in low light conditions. The back camera also supports several shooting modes such as Auto, Pro-mode, Panorama, Continuous Shot, Beauty Face, Sports. The camera app supports quick launch where you press the 'Home key' twice in quick succession. You may also use the volume key as the capture button; it comes in handy when you want to capture a selfie using the rear camera. Gesture Shot is also a cool feature you will enjoy on the Samsung Galaxy Luna S120VL. By raising your palm, the camera automatically takes a picture after two seconds. The Samsung Galaxy Luna S120VL ships with 4.5-inch Super AMOLED display. The resolution is 800 X 480 pixels. The display quality on the Samsung Galaxy Luna S120VL is a major selling point. What you get with a Super AMOLED display is vibrancy and vividness of the colors, this is probably why Samsung is the biggest supporter of Super AMOLED displays as you will notice in most phones they manufacture. The display on the Samsung Galaxy Luna S120VL is incredibly bright, this being an entry level gadget, it brings you more than you bargained for. Pictures and videos show up brightly; you get gorgeous looking colors and very deep blacks. The screen is also very responsive to even the slightest touch. Indoor visibility is great. The Samsung Galaxy Luna S120VL has an ambient light sensor that brightens up the screen automatically when you step outside and similarly lowers the light level when you get in a low light setting. This means outdoor visibility is not a problem on the Samsung Galaxy Luna S120VL. Super AMOLED displays have the technology to adapt to different lighting conditions and allow you to enjoy whatever you are doing without strain on your eyes. When I go out to buy a phone, I like to pick a phone that has a bright screen that shows every detail in the picture/video; the Samsung Galaxy Luna S120VL achieves this well. Onboard the Samsung Galaxy Luna S120VL is 2050mAh battery that gives you a talk time of up to 17 hours and standby time of up to 17 days. In my daily usage, the Samsung Galaxy Luna S120VL gave me a great battery life. As mentioned earlier, the phone has a Super AMOLED screen; the technology used in this type of display ensures longer battery life by lighting up only the pixel dots that need light to form an object on the display. Secondly, a 4.5-inch display is not as big to put too much strain on the battery. So, with typical usage, you can go a day without worrying about a charging outlet. Of course, internet services such as YouTube video streaming and intensive operations like gaming drains the battery faster, so for a super user, you are looking at about 6 hours of use on a fully charged Galaxy Luna. The battery is removable, so you have an option of carrying a spare battery in case your primary battery runs. The internal storage on the Samsung Galaxy Luna S120VL is 8GB, with about 4GB available to you. For a typical user who only needs basic apps installed, this is plenty of storage. One thing you will love about the Galaxy Luna is the capacity of the external memory card it can accommodate. It supports an external microSD card of up to 128GB! This slot will support microSDXC memory cards from companies like SanDisk and Samsung. With such incredible storage space, you can store thousands of music files, several videos, and photos, install games or practically any large app you've been avoiding because of limited storage. Though in the lower end price range, we found the performance of the Samsung Galaxy Luna S120VL to be competitively in the mid-range tier. I mean, it performed superbly, let's find out why. First, it comes running the fluid Android 6.0.1 Marshmallow. Few phones in this price range come running Android 5.1 Lollipop; most come running Android 4.4 KitKat. So you can take a guess. With Android 6.0 Marshmallow, you get the most fluid interfaces and animations, better multitasking, and some cool features like Google on tap - I will get into that later. The Samsung Galaxy Luna S120VL is powered by a Qualcomm Snapdragon 1.2GHz processor paired with 1.5GB of RAM. These resources ensure that you achieve all your tasks within record time. I didn't notice any lagging or freezes. Only very smooth animations, thanks to the sufficient run time memory. The phone also has 4G LTE which means browsing speeds are incredible. There's no noticeable buffering on YouTube and websites load even faster. Navigating in Google Maps is also a pleasant experience. With a quad-core processor, the phone is capable of multitasking. You can have several apps running in the background, and easily switch between them by tapping the recent apps button. In my case, I had like 10 apps running, and I didn't notice any freezes whatsoever because the phone could handle it. If you are into gaming, the Samsung Galaxy Luna S120VL will give you a great gaming experience. It's very responsive to touch and graphics show up brightly thanks to its super AMOLED display. Android Marshmallow plays a big part in the incredible performance of the Samsung Galaxy Luna S120VL. It has battery life optimization built into its core ensuring an extended battery life. You can also turn on 'Ultra Power Saving Mode' and stay for over a day with a battery at a minimum percentage. As I mentioned earlier, Android Marshmallow comes with Google Now on Tap feature which allows you to search and find information about whatever is on the screen. It could be a conversation in your messaging app or website open in your browser app. You turn on this feature by holding down the home button and Google will use whatever is on your screen to show you related apps, info, and actions. Other typical features that comes with the Samsung Galaxy Luna S120VL are Bluetooth 4.1 for sharing files between nearby devices, Wi-Fi, Proximity Sensor/Ambient Light sensor, accelerometer for controlling games by tilting the device, and compass to detect if the device is in portrait or landscape. Below are the specifications in a list format. Battery capacity: Talk time up to 17 hours. Standby Time 17 days. Internal Memory: 8GB. Supports external microSD of up to 128GB. Dimensions: 5.22 (Height) x 2.70 (Width) x 0.35 (Depth) inches.